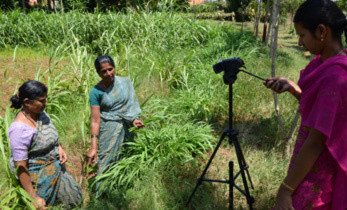 The first ever specialty trial in India to evaluate high-oleic groundnut lines resulted in 16 high-oleic lines being recommended for advanced trials. Enhanced rates of genetic gain for high-oleic trait were achieved with the help of advanced genotyping and phenotyping tools such as near-infrared reflectance spectroscopy (NIRS) and rapid regeneration advancement. This specialty trial was conducted at a workshop of the All India Co-ordinated Research Project on Groundnut (AICRP-G). 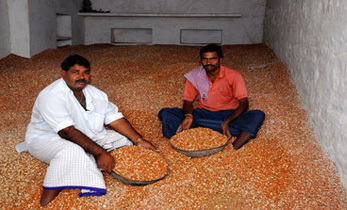 Groundnut breeders for various institutes across the country collaborated at the workshop. Groundnuts with higher percentage of oleic acid are better for the consumer’s health and for the processor (longer shelf life and better flavor). 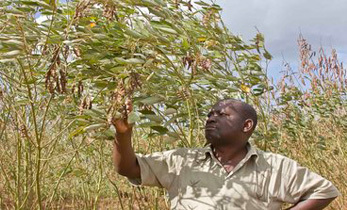 Hence, high-oleic trait is desirable and groundnut breeders at ICRISAT have been working towards it since 2011. During 2016 and 2017, the new high-oleic lines have been shared with collaborators in India, Uganda and Nigeria. 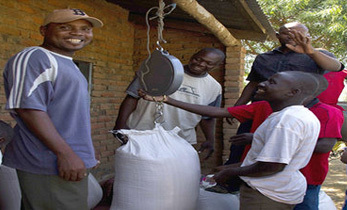 The process for sharing them with collaborators in Mali, Ghana and Myanmar is ongoing. Apart from the high-oleic trait, the breeding program has also obtained lines that present other traits, such as disease resistance, drought tolerance and high oil yields. In 2016, the first near-isogenic lines (NIL) trial was conducted for 12 marker-assisted backcrossing (MABC)-derived lines combining foliar fungal disease resistance with early maturity. At the above workshop, three NILs were promoted to the next stage of testing, Advanced Varietal Trial Stage II (See Table 1). 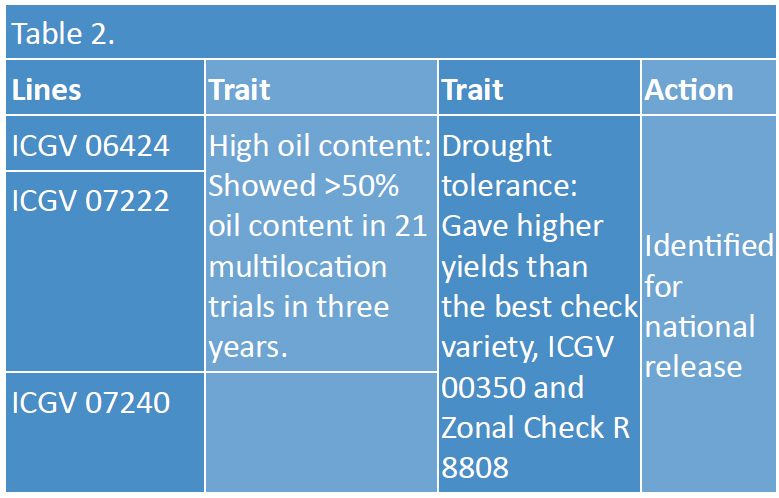 Moreover, three drought-tolerant lines were identified for national release; they gave higher yields than the best check and zonal check varieties (See Table 2). 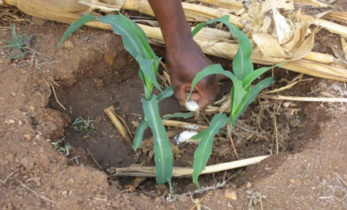 Of the three drought-tolerant lines, two are also high-oil lines and have consistently recorded over 50% oil across locations during the last three years of evaluation under AICRP-G.
One of the highlights of the Groundnut Breeding Program has been the rapid identification and release of high-oil lines from existing ICRISAT ‘elite genetic resources’. 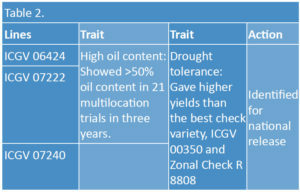 As shown below, out of the 160 lines from ‘elite genetic resources’ available at ICRISAT’s groundnut breeding program, 47 superior lines with high kernel oil content were identified and shared with partners in India when high-oil trait was prioritized as a key target trait for markets in India. From this material, 13 lines were recommended for national testing by partners and three were identified for national release (See flowchart below). The use of preexisting lines for identification of lines with a new trait served to accelerate the process. The AICRP-G workshop was held at Dharwad, Karnataka during 25-27 April. 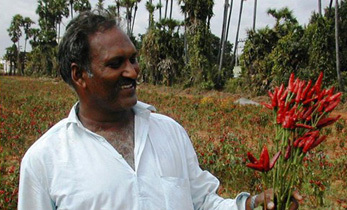 Partners: Indian Council for Agricultural Research – Directorate of Groundnut Research (ICAR-DGR), Junagadh; Junagadh Agricultural University, Junagadh; Tamil Nadu Agricultural University, Coimbatore; Acharya NG Ranga Agricultural University (ANGRAU),Tirupati; and Professor Jayashankar Telangana State Agricultural University (PJTSAU) Hyderabad.